JPY has been supported after the election however, USD has been empowered as well due to tax issue and the probability of interest rates growth. Japan has published Nikkei Manufacturing PMI Flash and the US will release Markit Manufacturing PMI Flash and Markit Composite PMI Flash. 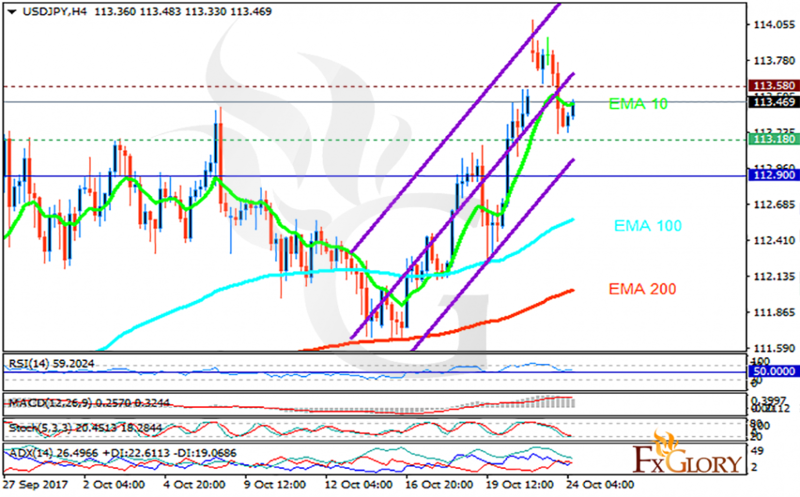 The support rests at 113.180 with resistance at 113.580 which both lines are above the weekly pivot point at 112.900. The EMA of 10 is moving with bearish bias in the ascendant channel but it is above the EMA of 200 and the EMA of 100. The RSI is rising towards the overbought area, the Stochastic is showing downward momentum and the MACD indicator is in positive territory. The ADX is showing weak buy signals.